What is your definition of a cutting garden? Do you envision rows of colorful daisies or beautiful roses in bloom? Maybe you have cut irises and lilacs fresh from your yard in the spring, bringing them indoors to brighten up your home. TGP Landscape Designer, Mary Saba and TGP Aurora Perennial Team Lead, Joannie Rocchi bring a combined wealth of knowledge and expertise to spur your own creativity with flower arranging year round. First, walk your yard. Ignore the to-do list running through your head, replacing it with a new perspective. Ask yourself what you have and how can you make it work. You will see your yard in a completely new light. For instance, there is a lower branch hanging from the juniper tree. Those willow branches are long and curly. Some of those hosta leaves are big enough to use as serving platters. The Rudbeckia are in bloom and could be groomed. Get the picture? Mary says the first thing about design is form, texture and color. Joannie adds that it all starts with the vessel, the container you are going to use. Will you choose that little rock, a Styrofoam tree or grandma’s crystal? Cutting gardens aren’t just roses and daisies anymore. Mary and Joannie draw inspiration from some of the top names in floral design and follow the latest trends, such as succulents. They can be mixed in containers with annuals and perennials, and give new life to broken pots and cracked birdbaths. Not your typical cutting arrangement, succulents can be cut and beautifully displayed on wreaths. The door is wide open when it comes to flower arrangements today. Mary reminds us that years ago, cutting flowers were needed that would hold up from the cutting fields to the florist to the vase. The rose had to be a tight bud vase in order to hold up and open in the vase. We are way beyond that now. We have jets bringing flowers from South America. We have floral additives. We have a huge assortment of foliage and flowers to choose from right in our own backyard and thousands more grown locally here at The Growing Place. So get excited and be spontaneous. Anything goes with floral containers, any combination. Planted containers require the same growing conditions, but even these can be spruced up with cut leaves and flowers stuck in the dirt. Think of form, shape and texture as well as color for your design. Use leaves, stems, foliage, buds and seeds along with flowers. Joannie experiments when designing. Some things work wonderfully and some things don’t. “I get enthusiastic and never stop learning,” she says. This Saturday, July 21st is Flower Power Fest in Aurora! 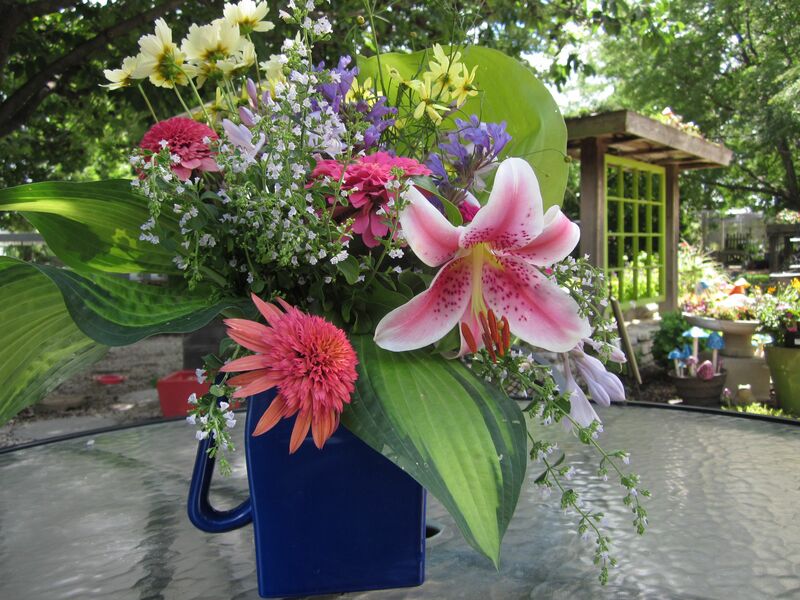 Joannie will share some of her secrets during her Cutting Garden and Flower Arranging class at 11am. She will use flowers, leaves and all sorts of things from the 20 gardens at The Growing Place and demo some beautiful bouquets. Bring the inspiration home to use in your garden. The whole day will a blast with garden tours at 10am & 10:30am, Canning & Pickling talk at 12pm and a Winemaking talk at 1pm. Come and learn from her creativity and see what’s blooming now. Flower arranging is not a bunch of baby’s breath and roses anymore.